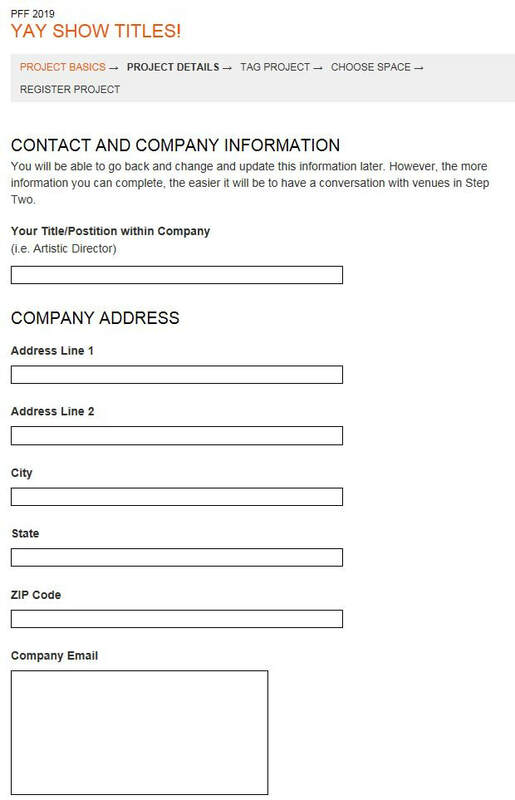 Before you start Step One of the application, look at this page. We have a list of all the questions you'll be asked throughout the process. That way you can make sure you have all your answers ready. Also, make sure you are ready to commit to the festival, because the $35 application fees are non-refundable. We do this in part, because when they were originally free, we had a lot of people not really ready to commit. 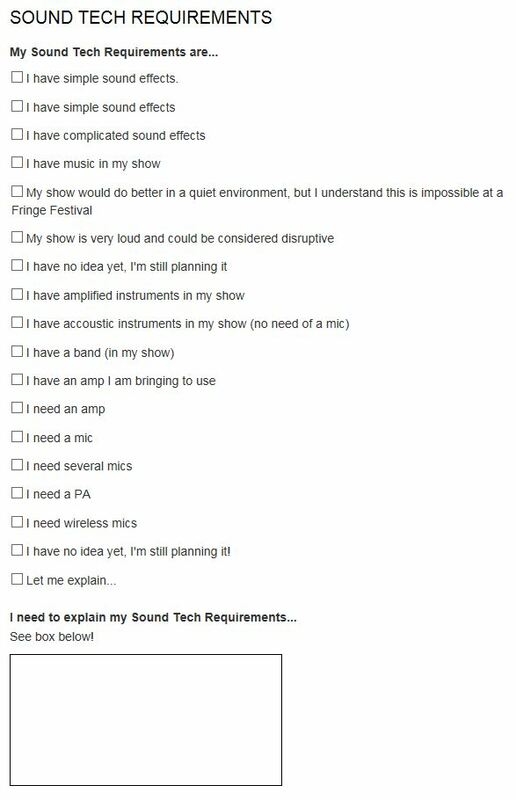 Then we wasted time that we could have directed towards helping performers that were really committed to doing the festival. Did you read everything on the 2019 Performers page? Everything you need to know is on that one page. 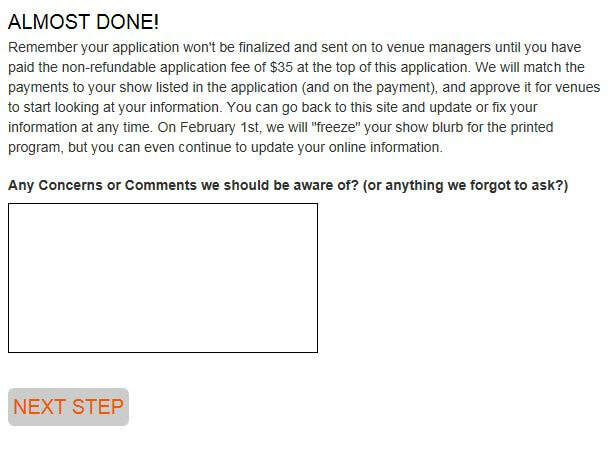 There is a $35 non-refundable fee for each performance or exhibition before you can start the application process. (If you do a BYOV venue (Bring Your Own Venue), there is no cost to register a venue. 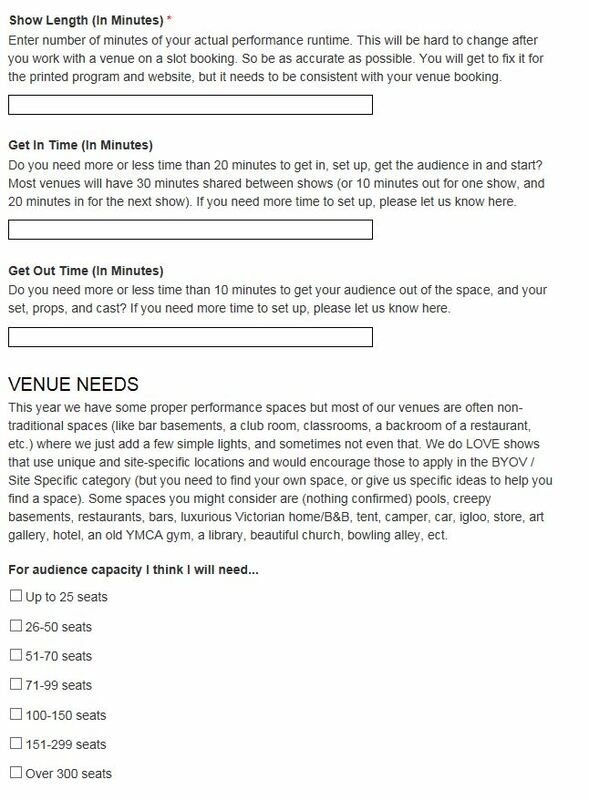 You may also make that venue available to other performers, or just for your own show.) Credit Cards and Paypal are accepted. Applications will be open from now until the festival. However, you will have more venue options earlier in the process, and more time to talk with venues the sooner you apply. 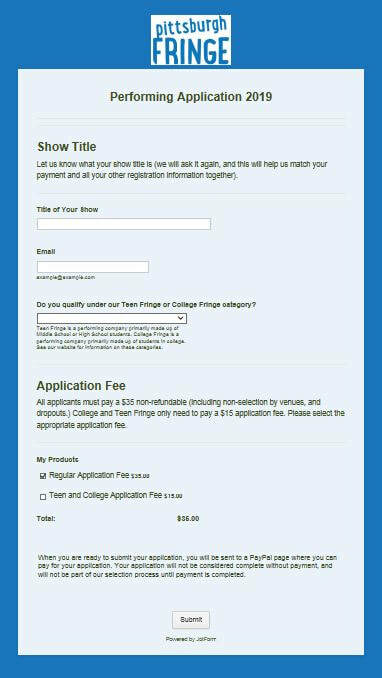 You will also save money if you make our early registration deadline on January 10, and you will want to be in the printed fringe guide the deadline which is February 1st. 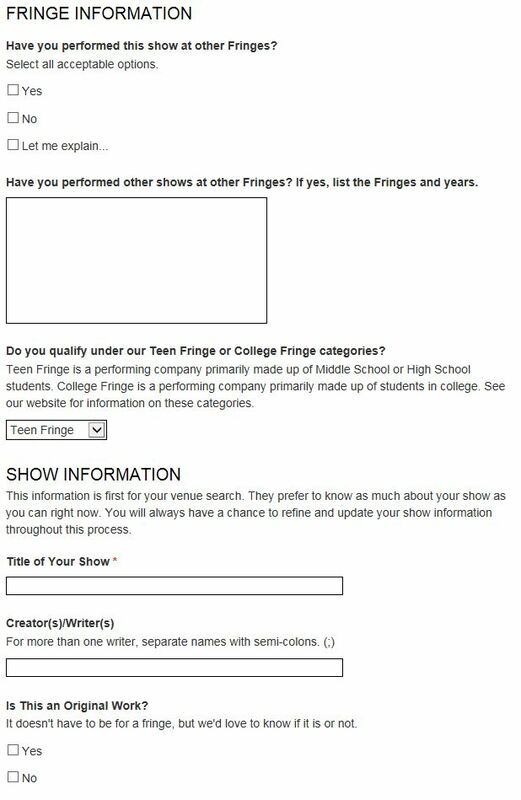 So as soon as you can figure out even the first draft of your show idea, get online and apply! This is a public project - anything you post can be seen by the Fringe world. Hopefully, it will attract some attention from members of the community who might be able to help by lending resources and assistance. 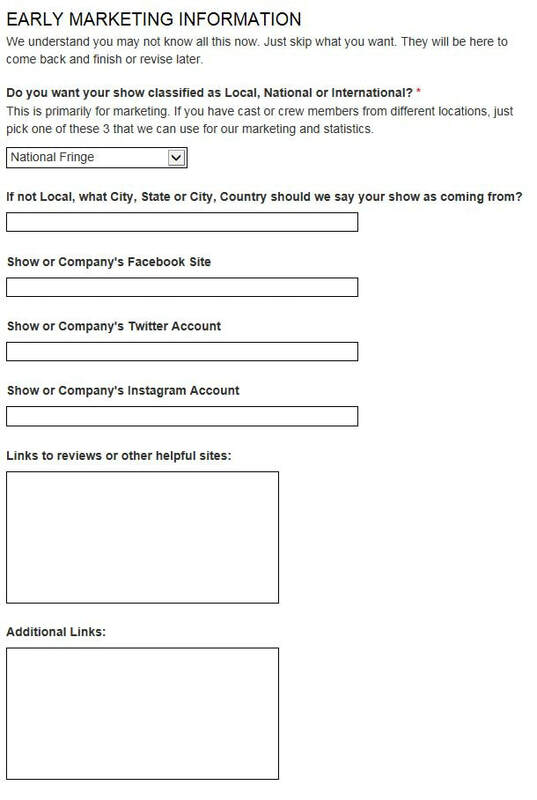 This first link will send you to the place you will tell us your show name, and pay your application fee. This Application Link will be up very soon, we are working out some more technical aspects. But feel free to read about how it will all work! Once you pay you will be given a link to start the application process. ​When you follow the link it will look like this. 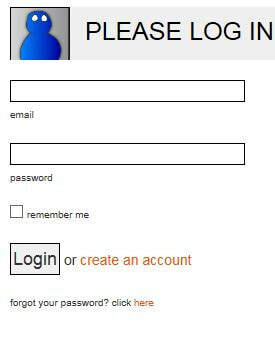 ​First you will create your own account and password for the site. You can now Log In Whenever! If you need to stop to get another coffee, no problem! you can come back and Log In and finish it up whenever! 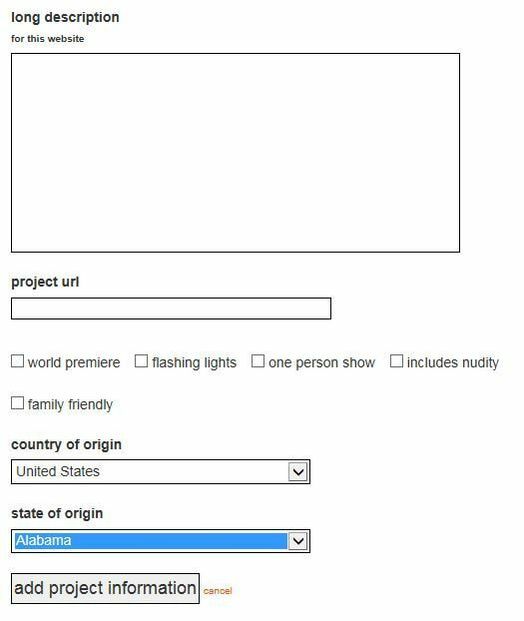 After your "Project Basics" are added, you will be directed to "Project Details." This is much longer, and in more detail. 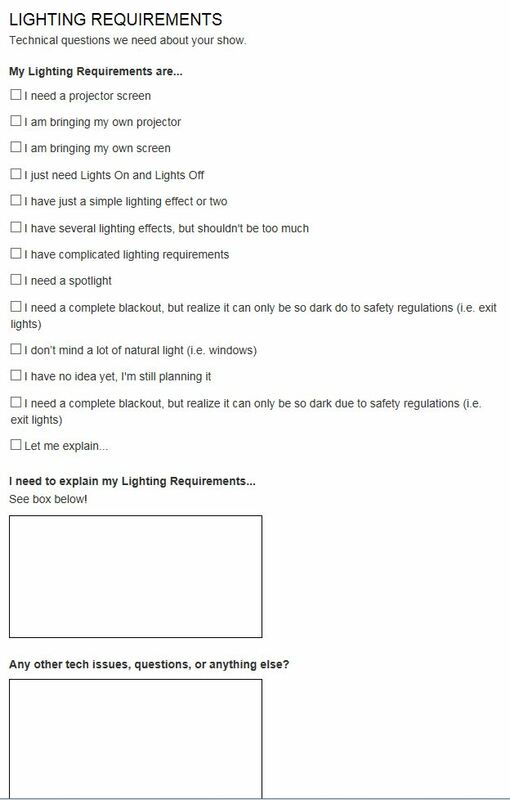 See below for the whole application. 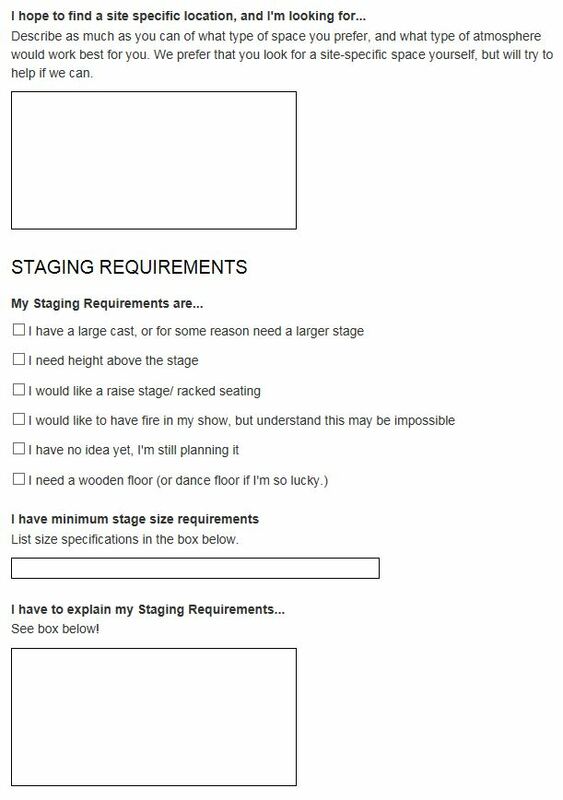 Not everything is required right away, but you need enough information to apply for a venue in Step Two! 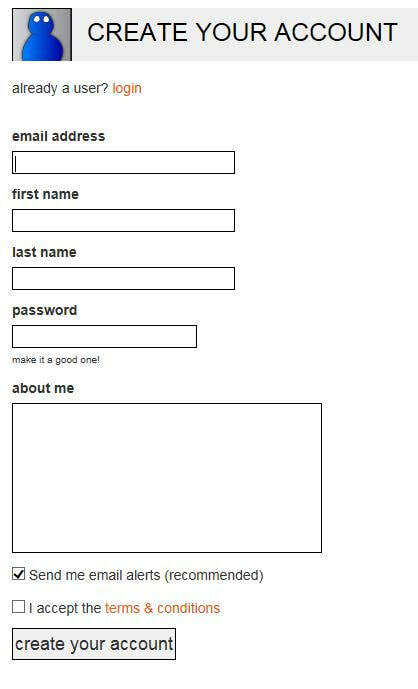 You can always go back to this step, and finish or update the information. ​ NOTE: See across the top of the webpage is the 5 specific parts of the process "Project Basics," "Project Details," "Tag Project," "Choose Space," and "Register Project." 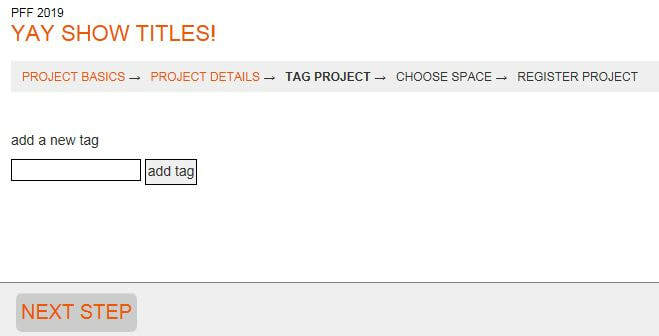 You only need to get to "Tag Project" at first. 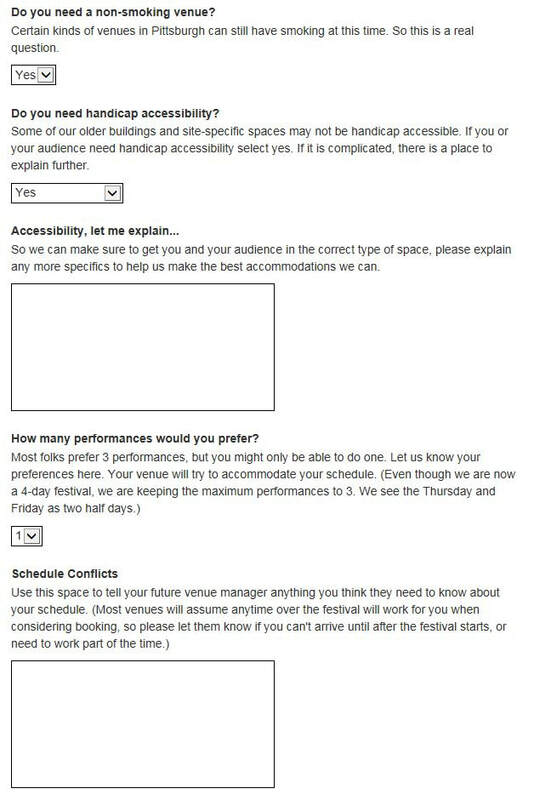 Then you can take some time to look through venues and spaces to decide what works best for you. That is Step Two, and you have more time on that step! The next on is much easier! 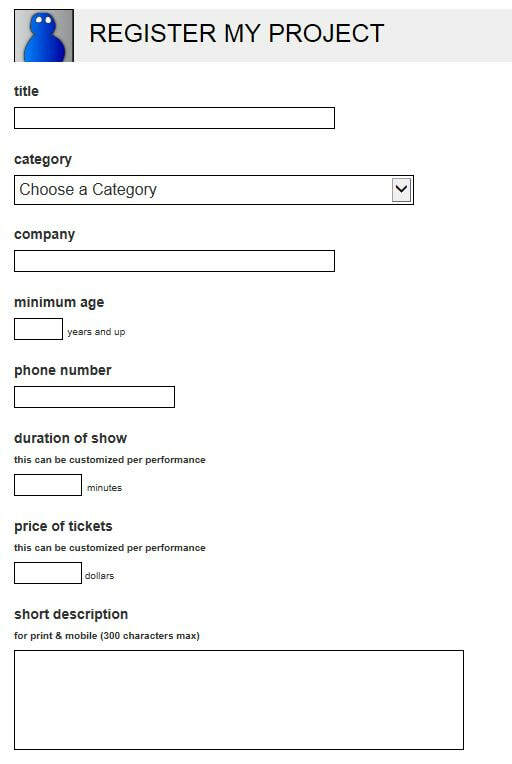 Add tags on this page that will eventually help audiences find your show! 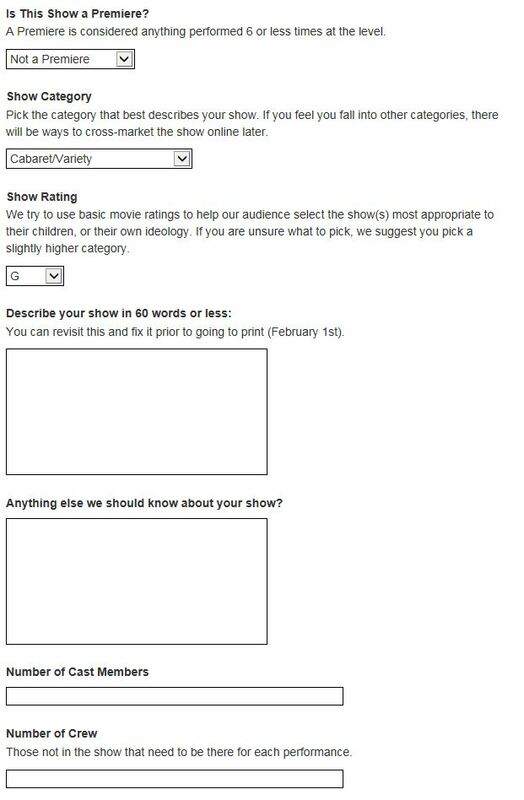 This is a great place to put descriptive words, or add another genre that describes your show. And don’t worry, you can always come back and add more tags. Need some ideas for tags? TAG IDEAS: Immersive, Political, Dance, Theatre, Comedy, Funny, Theater, Mystery, World Premiere, Pittsburgh Premiere, US Premiere, Physical Theatre, Love, Musical, Ensemble, Live Music, Original, Sci-Fi, Adaptation, Dark Comedy, Diversity, Solo Show, Absurdist, Cabaret, Family, Magic, Interactive, Adventure, Parody, Drama, or however else you would like to tag your show! You have now completely finished Step One! Now on to Step Two - finding a venue!